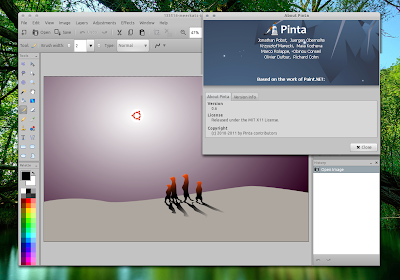 Pinta is a simplified image editor based on Paint.NET (and thus it uses Mono), designed to serve as an alternative to GIMP for casual users. Pinta 0.6 was released about a week ago and includes a huge list of bug fixes but the latest Pinta is not available in its PPA so I've decided to backport the Natty package to Lucid and Maverick. For a complete list of bug fixes in Pinta 0.6, see the release announcement. Since Pinta 0.6 is 100% identical to the package in Natty, if you encounter any bugs please report them at Launchpad. If you're not using Ubuntu, you can download the Pinta source files or Windows binaries from HERE.